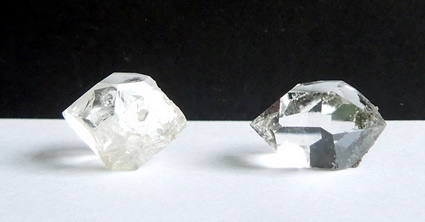 I like the juxtaposition of these two Herkimer Diamonds - water clear and cloudy. 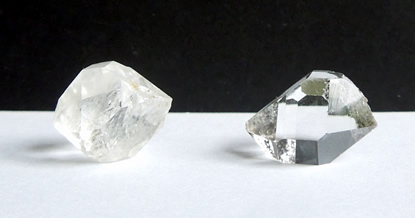 The 15x12.5x11 mm / 9.3 ct. crystal is 'cloudy'. 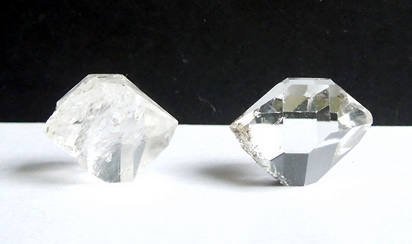 It is filled with wispy and flat inclusions, giving it an almost white color. These inclusions also allow for rainbows to sparkle. Externally minimal growth occurrences are present. 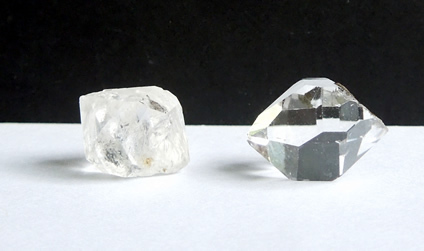 The 16x12.5x9.5 mm / 9.4 ct. Herkimer has excellent clarity, it's completely clear inside. Externally, one facet is covered with a coating of black hydrocarbon, also referred to as anthraxolite. This give the crystal a beautiful dark hue. 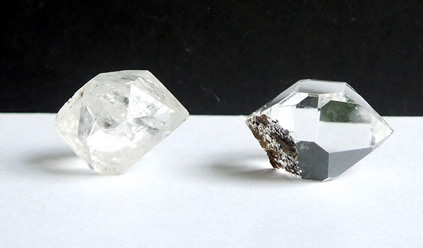 Both Herkimer Diamonds have the unusual gumball shapes and double termination points. 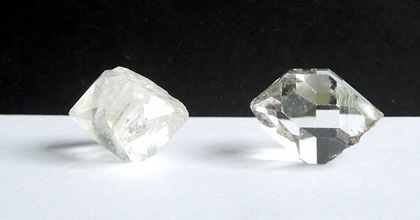 One clear with a smoky hue, the other bright with wispy inclusions.